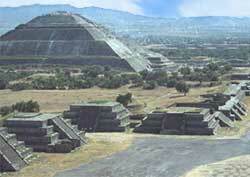 Teotihuacan is an extensive ancient religious complex near Mexico City. Its many architectural marvels include the enormous Pyramid of the Sun (see photo), one of the grandest monuments ever erected. However, little is known about the ancient people who built it a thousand years before the Aztecs came into power and Cortez arrived. Middays can be sweltering, so come early or late to avoid the heat (and crowds). And early is preferable to late because thunderstorms occur more frequently in the afternoon. In the wintertime, the temperature can become nippy and a bit raw. of Mexico City. The trip takes an hour by bus or car.